Hi Stampers. Welcome to our Global Stamping Friends blog hop. Today we are featuring ways to use Stampin’ Up! to create Home Decor. When most people think of Stampin’ Up! 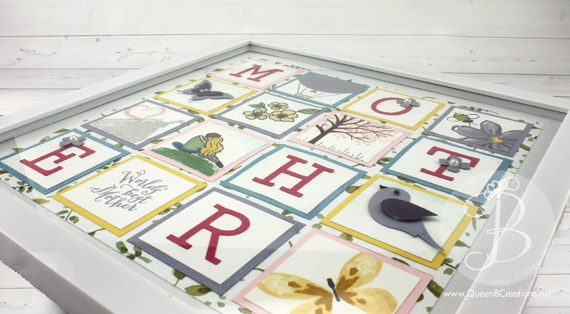 they think card making and maybe even scrapbooking, but it can be used for a whole lot of things, including home decor. This Ikea clock was made over using the Stampin’ Up! Coffee Cafe stamp set and the (recently retired) Number of Years stamp set. It’s stamped in Early Espresso, Sahara Sand and Garden Green inks. This Ikea clock was made over using the One Wide Ride stamp set and the (recently retired) Number of Years stamp set. The inks used here are: Memento Black, Pumpkin Pie and Smoky Slate. The banner was colored in with the Pumpkin Pie Stampin’ Blends. This Wal-Mart clock was made over using the Varied Vases stamp set and the (recently retired) Number of Years stamp set. I stamped this clock using Blackberry Bliss, Highland Heather and Gorgeous Grape inks. The flowers were then colored in using Stampin’ Blends. It’s really an easy process to make over the clocks and almost any analog clock (smaller than your sheet of cardstock) will work. I just took the clock apart and removed the face that it came with. Using the original clock face I traced around the circle onto a piece of Whisper White cardstock. I cut out out this circle with paper snips. Placing the original clock face under the new clock face up against a light source, I used a pencil to mark where the numbers needed to go. I then stamped the 12, 3, 6 & 9 with the numbers onto the new clock face. (These numbers could even be stamped with an image, since most people know the basic orientation of an analog clock.) The other numbers on the clock were stamped with a small image from the stamp set. I created a focal image in the center of the clock face. This focal image can be any theme that you wish using just about any stamp set. You just need to use your information and give it a try! After the clock face was complete, I used the multi-purpose adhesive sheets on the back side of the clock face. (You probably don’t want to use liquid glue because the paper may buckle after a while). I used an anywhere hole punch to punch a small hole in the center (you can also make a small x with an x-acto knife) and placed it back into the clock. I then replace the hands and re-assembled the clock. It’s then ready to give as a gift or hang on your wall. I hope you enjoyed my project and got you thinking about how you can use Stampin’ Up! products in your home decor. Please click the “next” button or follow along on the blog hop line up to get more ideas. Happy hopping! Hi Stampers. Hello from soggy Northern California. The weather report last night said that we have had 28 inches of rain since January 1st. That’s 205% of normal!! I know we need the rain, due to the drought we are in, but I’m a little tired of all the flooding and mudslides…. In honor of the mudslide clean up I’m sharing my construction banner today. This banner was made using the Stampin’ Up! banner framelits. I used the largest banner framelit and Basic Black card stock for the base, then the next size down framelit with Crushed Curry card stock. I also used a torn layer of Soft Suede card stock over the Crushed Curry layer to look like dirt. The letters were cut out of Basic Black card stock using the Large Letters framelit dies. I rested them on top of the “dirt”. Here is a close up look at one of the letters, so you can get a better look at the torn edge. This little cement truck was cut using my Silhouette Cameo e-cutter and a design I purchased from the Silhouette Design Store. The different colors were cut out separately and layered on top of each other to complete the truck. (I used Basic Gray, Crushed Curry, Tangerine Tango, Basic Black and Whisper White card stock). The little clouds were cut out using the Up & Away framelit dies and Whisper White card stock. On the “dirt” and trucks I used some Soft Suede ink on a sponge dauber to rub a little extra “dirt” onto them to make them look “dirty”. This banner is for sale in my Etsy store online. It would be perfect for a little ones first birthday. It can hang on the wall or across the front of the high chair. Of course if you want to make your own, I have listed the supplies needed below with links to buy them from my Stampin’ Up! store. Don’t forget that we are almost half way through Sale-a-bration! This is your chance to earn a free product with each $50 you purchase in Stampin’ Up! product and is a fantastic time to join my Kingdom and become a Stampin’ Up! demonstrator on my team and earn yourself two extra stamp set for FREE! For my project, I chose to make “kiss tents”. Each of these cute characters has a Hershey Kiss as the base and the Snow Place bundle (stamp set and framelits) from Stampin Up!. The snowman family can sit out as decoration and the penguin can be hung on the tree. Each “kiss tent” starts with a strip of Whisper White card stock .75″ x 3.75″, scored at 1″, 2″, 3″. I put two glue dots on the bottom of a Hershey Kiss and placed it on one of the 1″ sections, then wrapped the card stock around and adhered it to itself to form a triangle covering the kiss. Then stamped 2 of each of the snowmen / penguin / accessories onto Whisper White card stock, using Tuxedo Black ink for the characters and Real Red ink for the accessories. I then colored in the nose and feet with a Pumpkin Pie marker. I then used the framelits to cut them out on the big shot. I then used mono adhesive to glue one side of a snowman/penguin and attach the bottom it to the kiss. I glued up and used the matching piece and glued it to the opposite side of the kiss, making the characters touch at the top. I then adhered the accessories and attached the cord to the penguin through a small hole punched in his hat. As a base for the snowman family I used Whisper White and Rel Red card stock with the Lots of Labels framelit set. I will be making a video soon of “kiss tents” using the fox builder punch – so stay tuned! Hi Stampers. 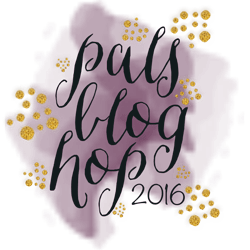 Welcome to the Pals Blog Hop for April 2016. We are thankful you stopped by to take a look at our new 2016 Blog Hop monthly themes. This month we are featuring projects that are all about our families. This is a great time of year to think about what to make for Mother’s Day, Father’s Day, or upcoming graduations. And, family vacations are just around the corner… how would you want to remember those special family moments? We hope to provide you with lots of ideas and that you enjoy our creations. In February, my husband took me to Reno for my birthday. We stayed a the Peppermill Resort and he bought me a “birthday” treatment at the spa there (massage, pedicure and a birthday cupcake). It was the best spa I’ve ever been to!! If you are ever in Reno, NV – make sure you make an appointment to get a massage with Grey at the Spa Toscana, she is AMAZING! While in Reno, I wanted to check out their Hobby Lobby, since we don’t have one back home. They had a sale on frames and I purchased several of these great frames. There is a gap (of about 1/4 inch) between my project and the glass giving me plenty of room to use pearls, rhinestones and Stampin’ dimensionals. I’ve often admired the samplers I’ve seen on Pinterest and wanted to give it a try. I made an “Easter” one and one that said “Family” that can been seen in my Etsy store and on my Pinterest page. 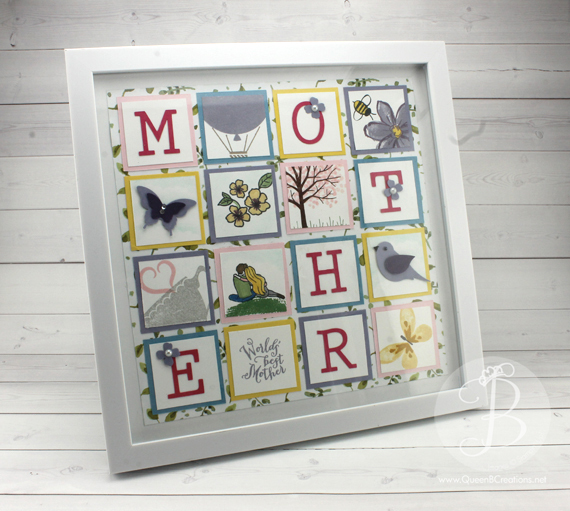 For this blog hop – I made one for Mother’s Day. It’s for sale on Etsy – HERE. My frame was 11″ x 11″ overall. I cut the piece of Designer Series Paper 9″ x 9″. I then decided I wanted 16 squares, so I did a little math and decided on 2″ x 2″ colored squares of card stock (Perfect Plum, Marina Mist, Daffodil Delight and Pink Pirouette) and 1.75″ x 1.75″ Whisper White card stock over that. I cut the letters out of Melon Mambo card stock on my silhouette cameo – although you could use the Little Letters framelit dies. I placed the letters in various squares spelling out M O T H E R. I then got out some stamps and punches and decorated the remaining squares trying to do a little of everything – after all, it is a sampler *wink*. The letters still looked lonely, so I used my bitty flower punch and punched out some flowers and put a pearl in the middle and accented a few letters. I also added a little sparkle with my clear wink of stella brush. Stampin’ Tip: I glued the DSP to the cardboard that came in the frame and then arranged the colored card stock and glued the corners first, then the two between the corners on each side, and then the middle. I adhered the white squares LAST. I can’t tell you how many times I rearranged them until I liked the look.